We offer you best tips for growing artichokes in a backyard vegetable garden. Learn how to plant, care for, and harvest artichoke plants when home gardening. The artichoke is considered a noble vegetable because this eastern Mediterranean native was once reserved for members of nobility. Currently, artichoke plants are popularly grown throughout the temperate regions of the United States both as garden produce and planted for its ornamental merit. This large, fern-like plant grows up to 6 feet tall and 8 feet wide. Six or more flower buds grow atop long, coarse stalks every year. If not cut, these buds open into showy purplish blue flowers that resemble thistles. Grown solely as ornamentals, growing artichokes make a useful and beautiful summer hedge or garden space divider. The edible flower buds mature best in cool weather but cannot tolerate frost. Artichokes have been successful in colder regions when started indoors from offsets and planted outside after danger of last spring frost has passed. The artichoke needs protection during cold weather to survive. Cut leaf growth back to 12 inches and tie them together over the root crown. Apply a heavy layer of mulch to protect them from frost. Be extra careful when mulching as not to choke the growing artichokes. 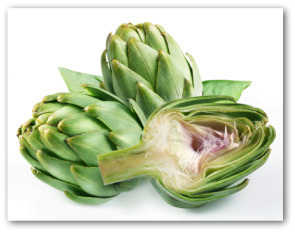 Plant artichokes in high quality, loose soil rich in nutrients. An area which receives full sun is preferable. Artichokes have high demands on soil, so fertilize generously and water thoroughly. Wet the entire root system on a weekly basis to prevent drying out of soil. Growing artichokes from seeds frequently produces a lower-quality plant. Green Globe Improved is the variety which has had the most success. Artichoke is best grown in frost-free areas. A sunny location in a cool, moist climate is preferable. Plant in rich, high-quality, loose soil. Water thoroughly and fertilize regularly. The plants can take some drought if grown only as an ornamental. Propagate in spring by seed or division. Root division is preferable since seeds give more variable results, often producing flower buds that tend to be small and fibrous. 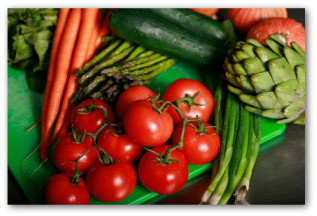 The vegetable has a long growing season of 150-180 days to maturity. For best results, replant artichokes every 3-4 years. Very hot weather will produce hard buds or cause them to open early. Artichoke is susceptible to a number of insects including aphids, snails, slugs, and artichoke plume moths. Be on the lookout for leaf spot disease. For large sized, meaty artichokes, remove the numerous minor shoots as the plant grows so that each plant has only six buds per season. 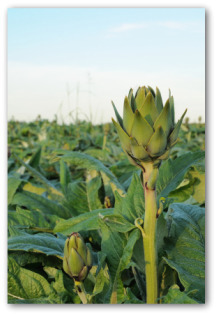 Artichokes planted in the springtime may be expected to produce during early summer months. The plants will mature from fall through midwinter in mild climates or until hard frosts. Flower buds may be edible the first year after planting if conditions are ideal. However, most often plants will produce the second year. Harvest before they reach the blooming stage. Cut 3-4 inches below the bud with a sharp knife when harvesting. As leaves begin to yellow, cut stalks near ground level to avoid weakening the root, allowing new shoots to spring up. 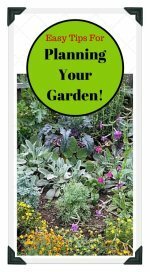 Keep in mind the large size of the artichoke plant when you choose your location. 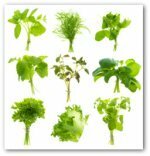 The plant may be too bulky for smaller home vegetable gardens. 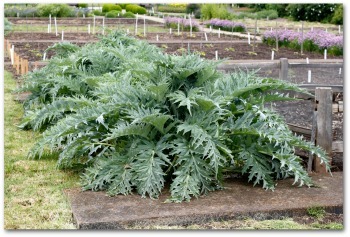 But as it makes a dramatic addition to an ornamental bed, this may be a way to grow a few artichokes for eating purposes. 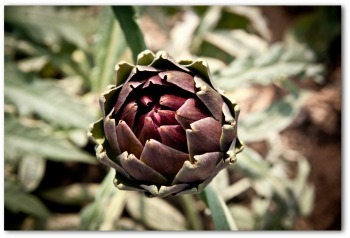 The edible flower heads of the growing artichokes can be eaten raw or cooked and served in butter or sauce.